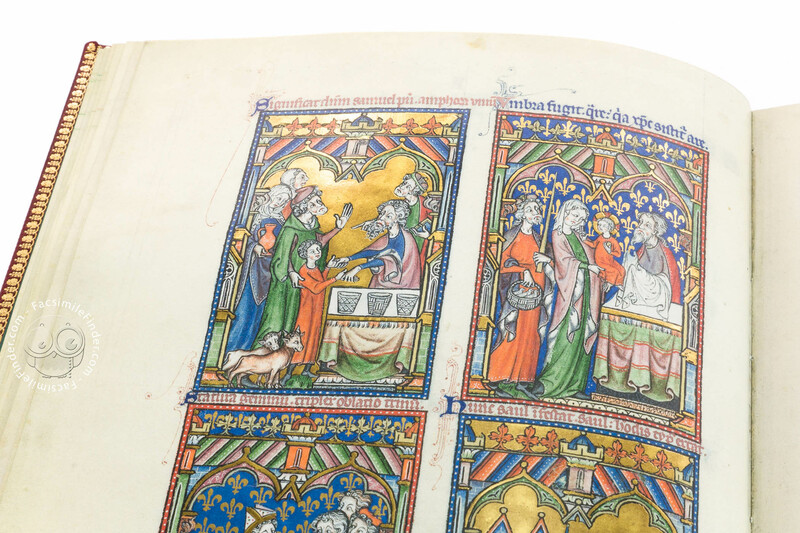 The Peterborough Psalter, now in Brussels at the Bibliothèque royale de Belgique (or Koninklijke Bibliotheek) under the shelf mark ms. 9961-62 (was 1533), is a lavish English manuscript written and illuminated, circa 1300-1318, either in London or Norwich. 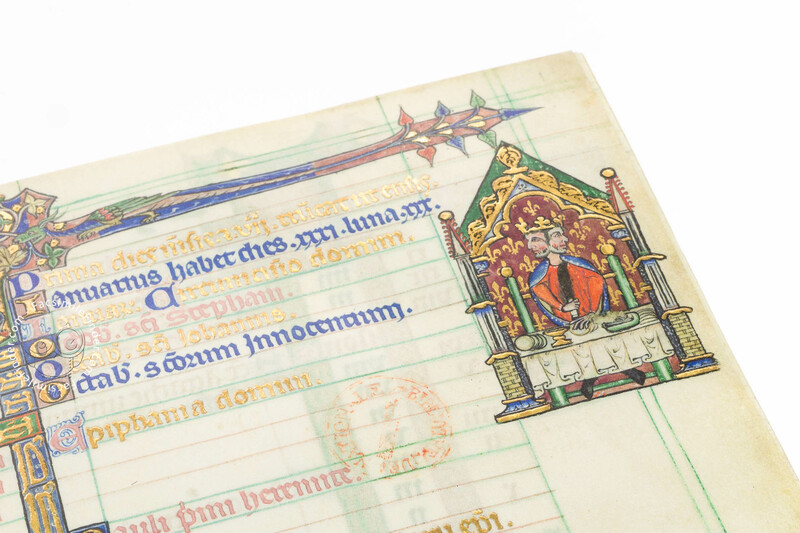 The manuscript comprises 141 sheets of fine parchment, measuring 30 x 19.5 cm (approx. 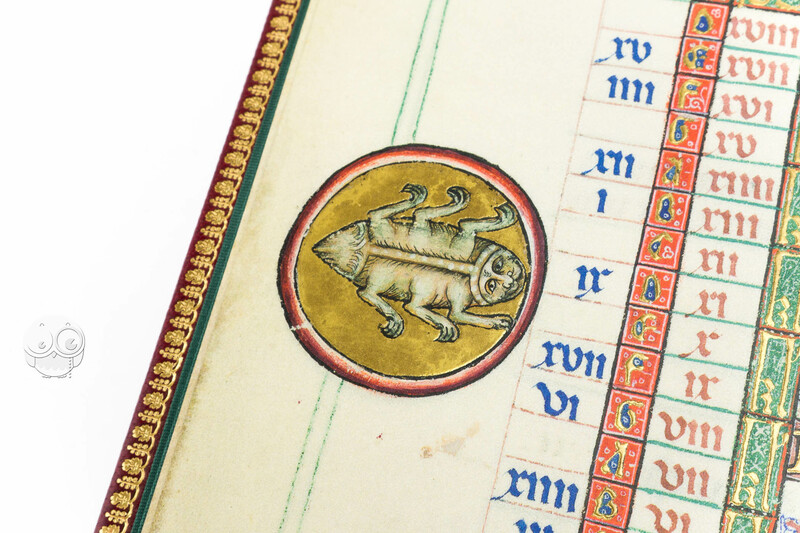 11.8 x 7.7”). 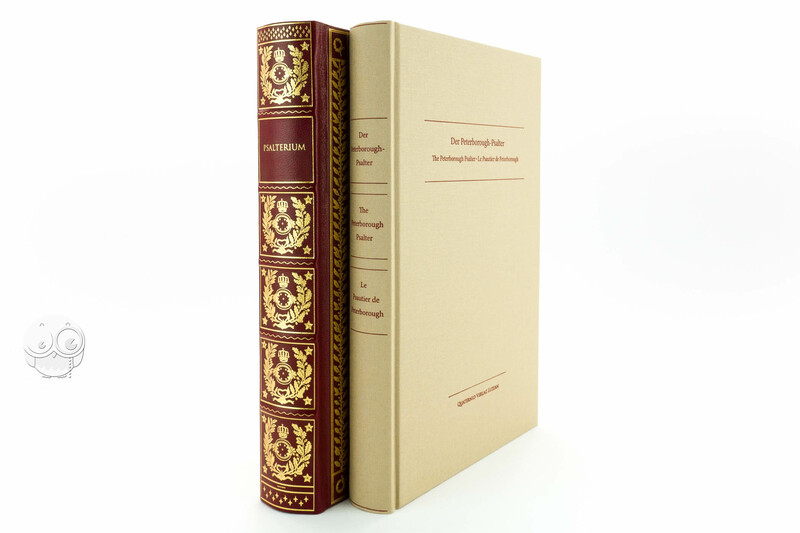 The text is written in littera gothica textualis and generally organized in two columns. 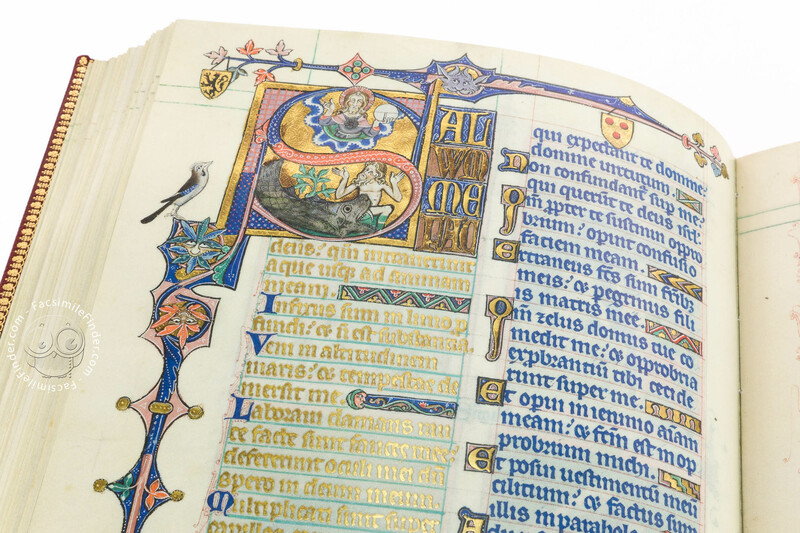 Each page has one column entirely written with blue ink, while the other is made of gold leaf. 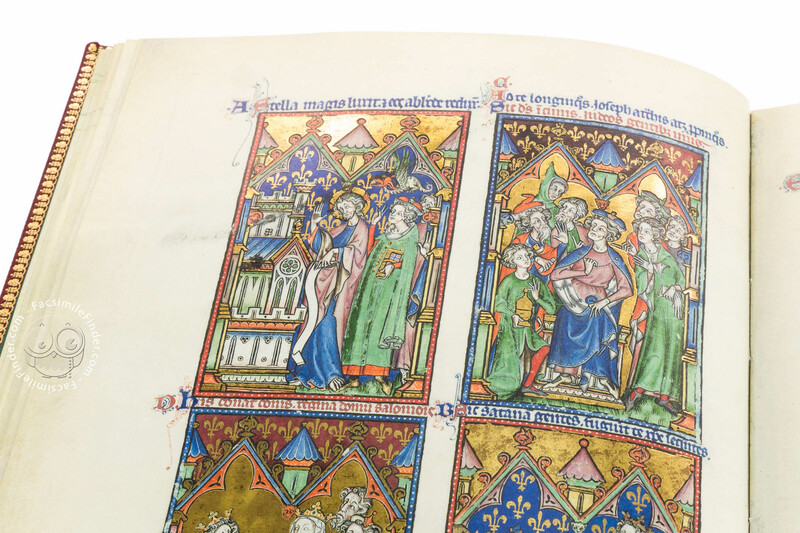 Some pages are entirely written either in gold or blue. 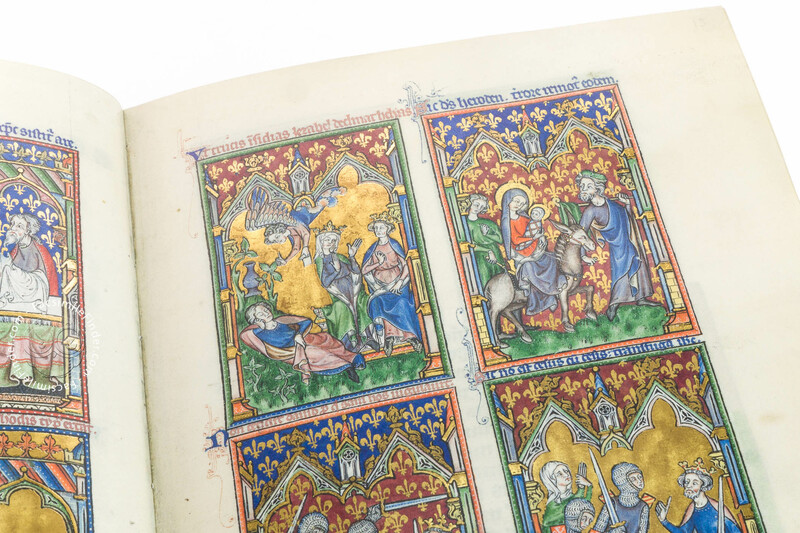 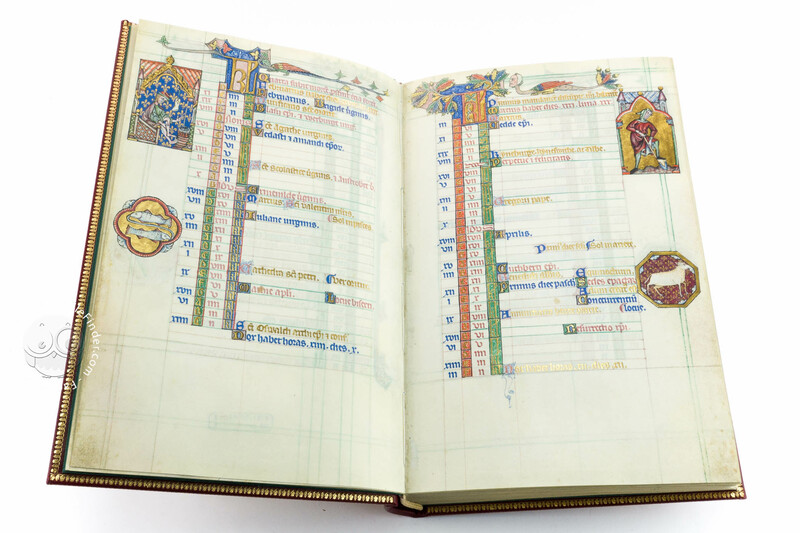 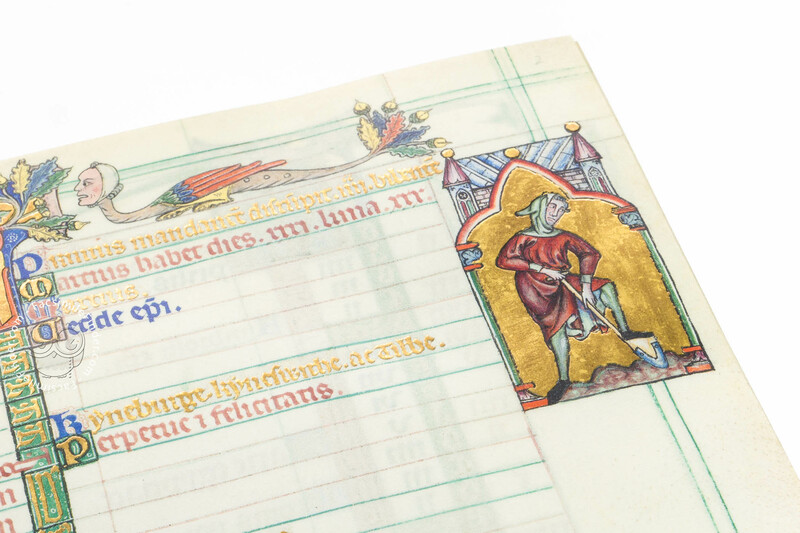 The Peterborough Psalter in Brussels is a richly illuminated manuscript: more than a hundred scenes are depicted in 26 fully illuminated pages, in addition to other miniatures, decorations and many historiated initials of striking beauty. 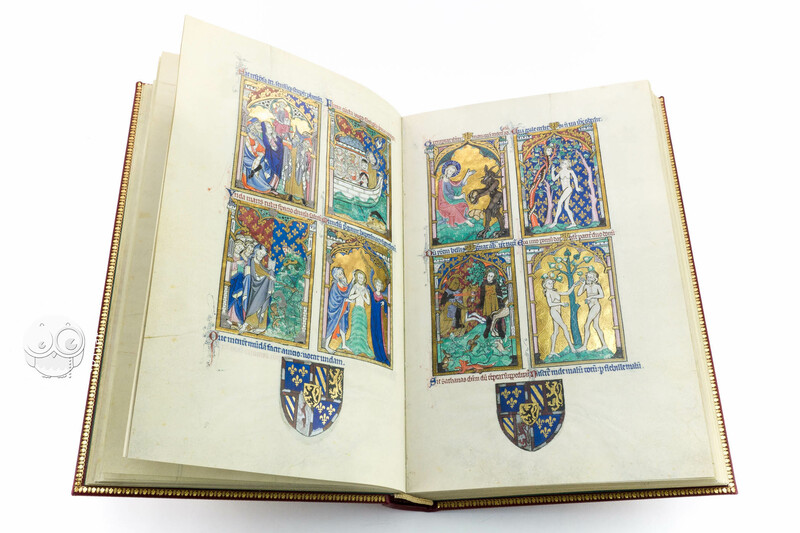 The manuscript is considered the most beautiful of a group known as the Fenland manuscripts. 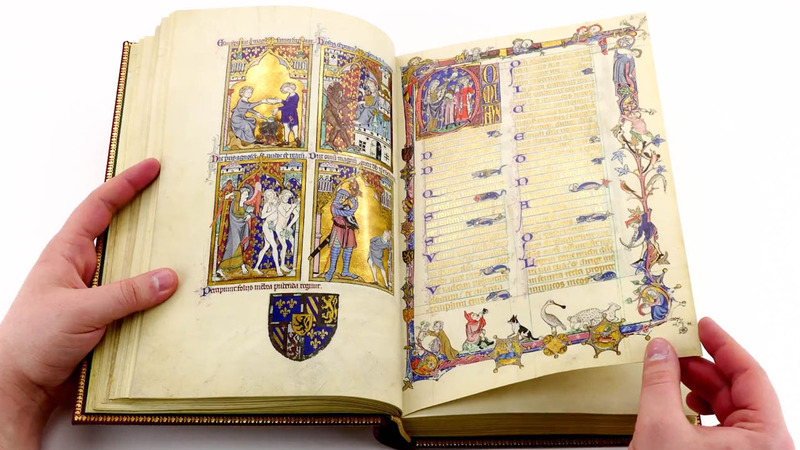 Lucy Freeman Sandler first described and clearly isolated the group of so-called Fenland manuscript in her book “The Peterborough Psalter in Brussels & other Fenland manuscripts” (London: Harvey Miller - New York Graphic Society, 1974). 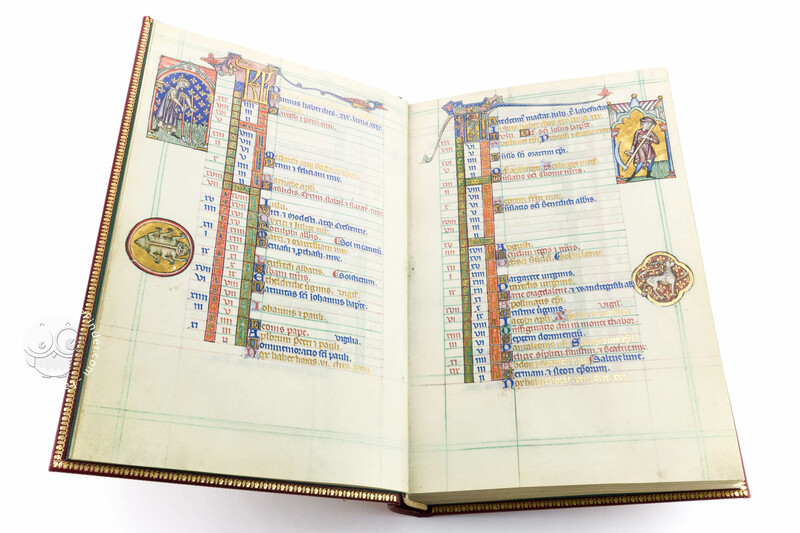 The Fenland manuscripts are grouped together on the basis of stylistic and iconographic features, and are separated from the East Anglian manuscripts because of a number of reasons: among the others, while the East Anglian group was mostly commissioned and owned by laymen, the Peterborough Psalter in Brussels and the other Fenland manuscripts were associated with Benedictine establishments. 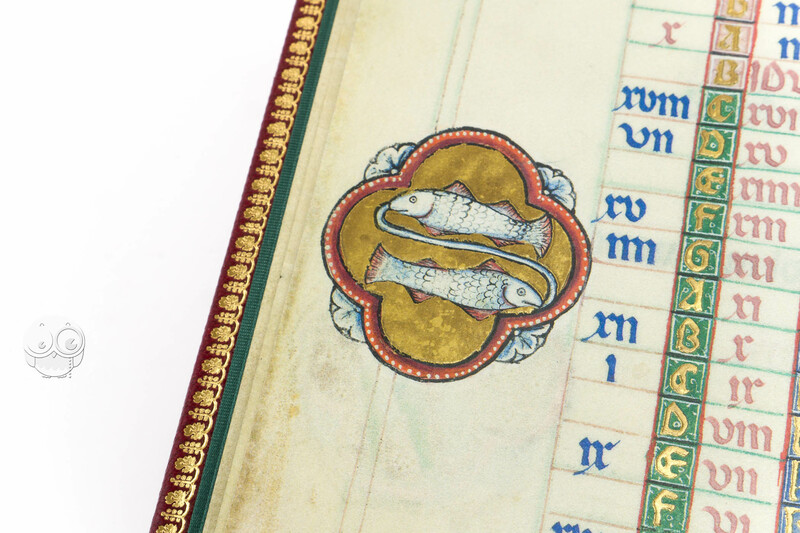 Master C is responsible for the last two sections before the Canticles. 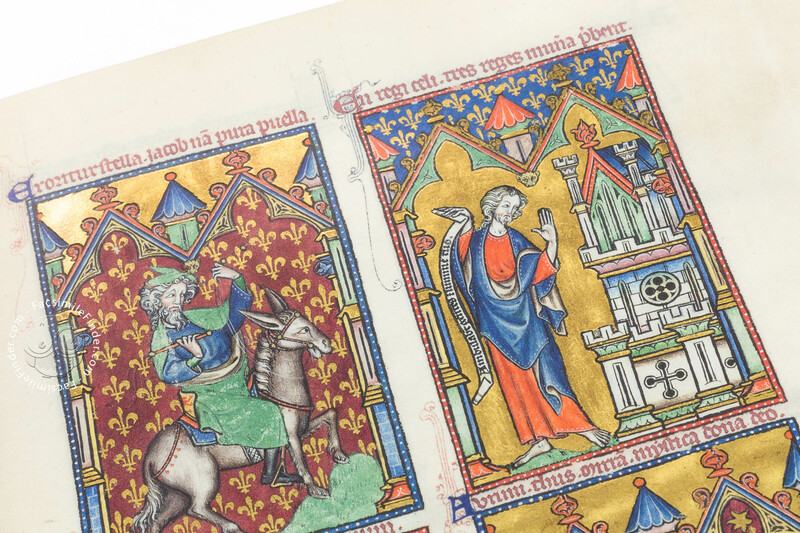 The same masters’ style is recognizable in other manuscripts of the Fenland group: for example, Master B probably carried out the Ramsey Psalter while Master C painted the Gough Psalter, together with another artist stylistically similar to the Master B. 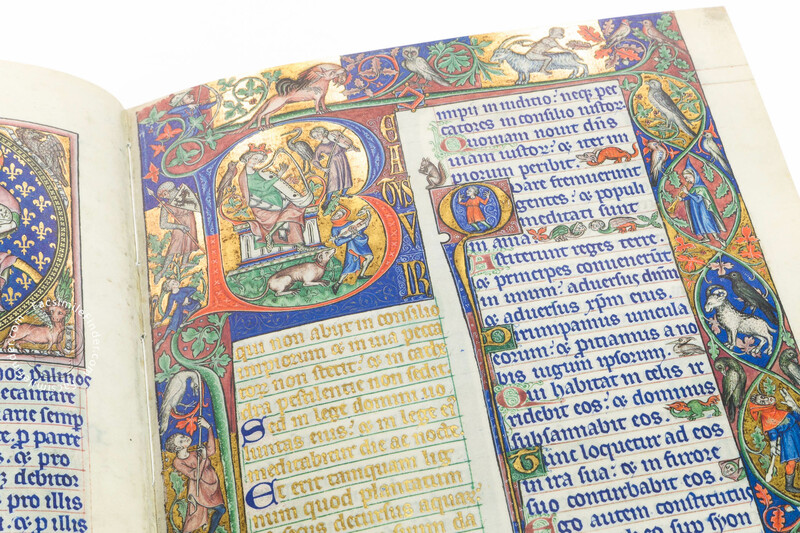 Such richness gives the status of most beautiful manuscript among the Fenland group to the Peterborough Psalter. 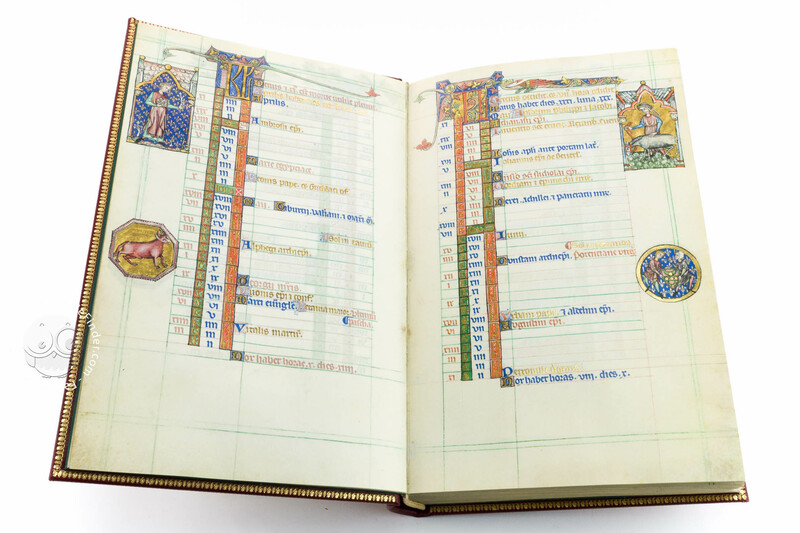 The layout and order of the scenes, though, is somehow unordered: a hypothesis for this is that the iconography is based on a model book whose pages became disordered. 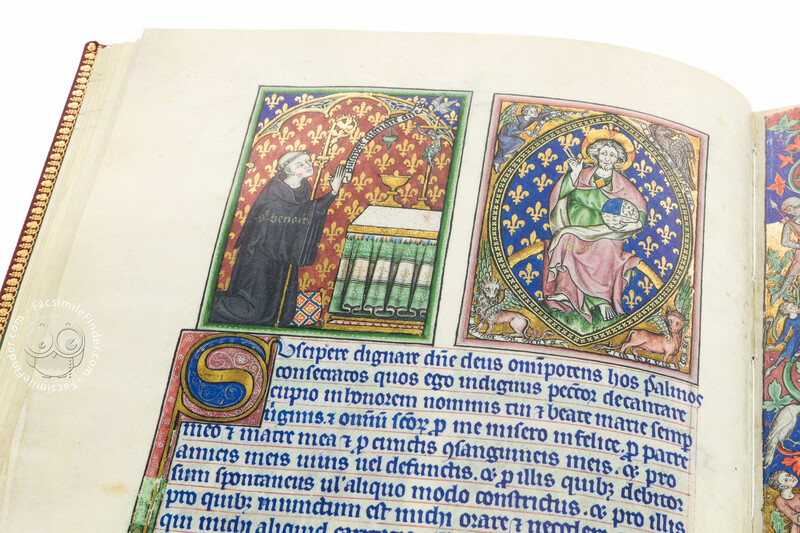 Geoffrey of Crowland abbot of Peterborough (1299-1321) is almost certainly the patron who commisioned the Peterborough Psalter. 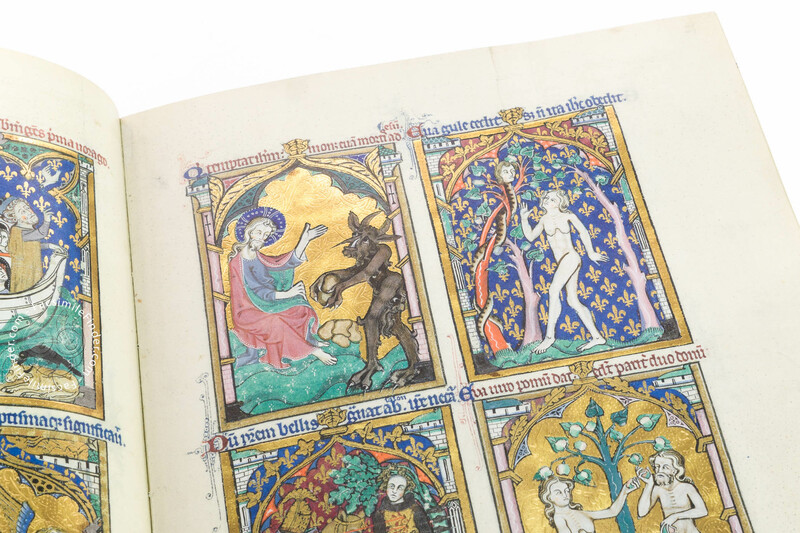 After him, the manuscript was in the possession of many individuals and libraries, eventually becoming part of the collection of the Bibliothèque royale de Belgique. 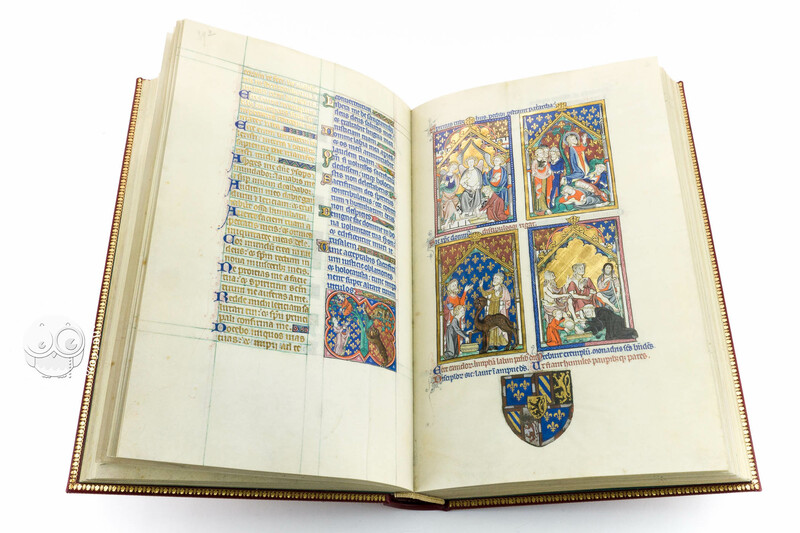 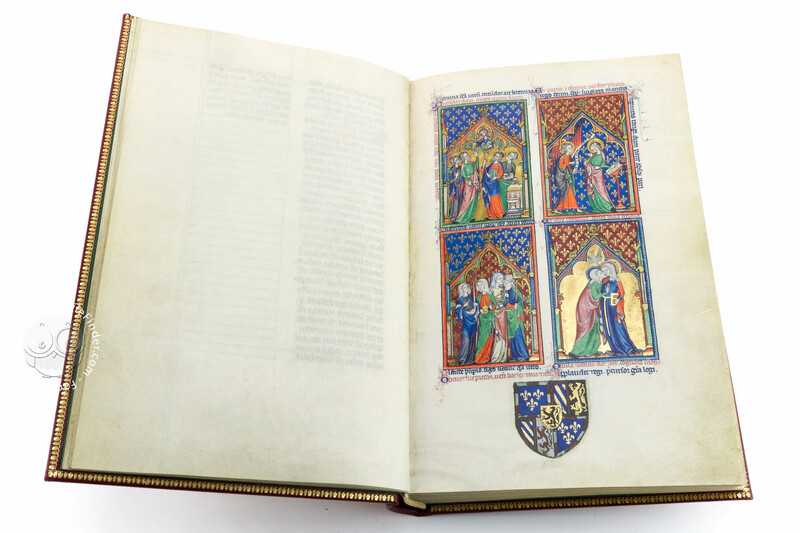 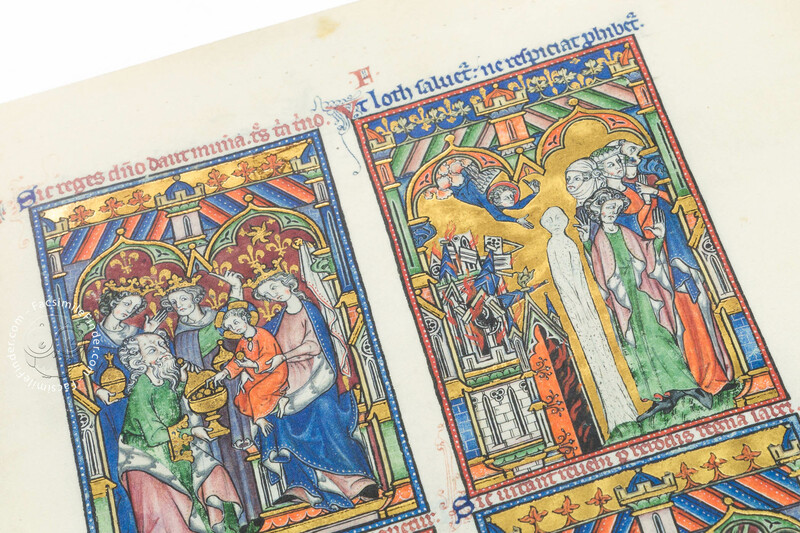 Among other people, the manuscript was owned by Pope John XXII (1244-1334); Clemence of Hungary, queen of France (1293-1328); Philip VI of Valois (1293-1350); the Library of the Louvre; Philip the Good, duke of Burgundy (1396-1467); the Bibliothèque Nationale de Paris; the Burgundian Library in Brussels, and finally the Bibliothèque royale de Belgique. 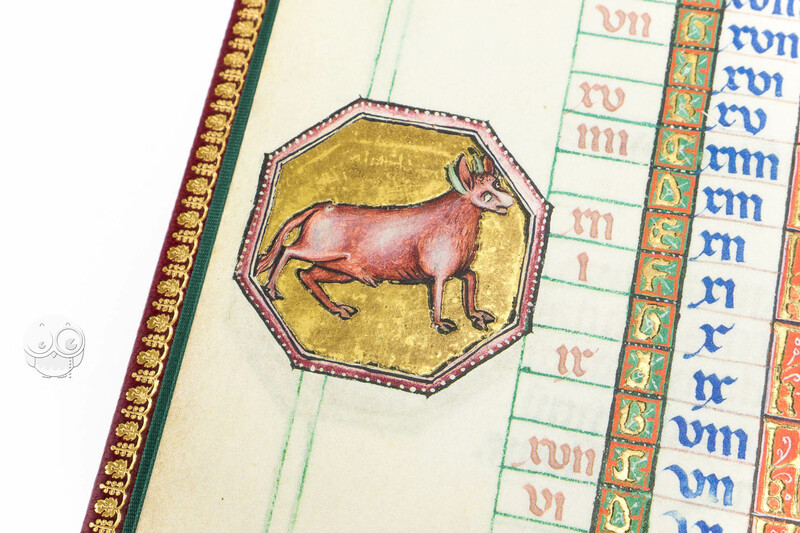 Red leather with gold and dry debossing. 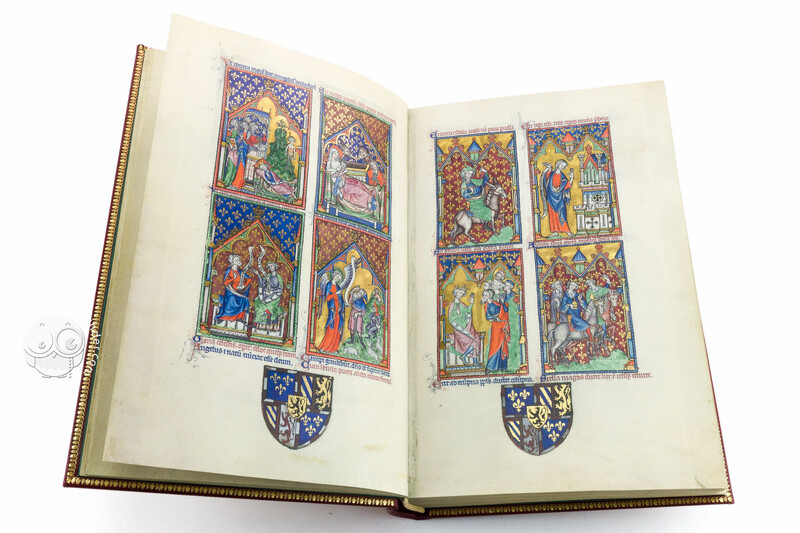 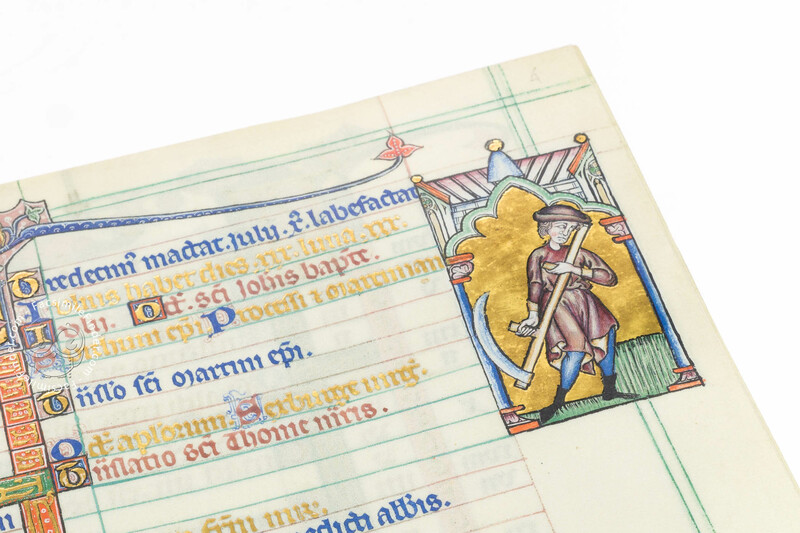 Peer review of the book by Lucy Sandler "The Peterborough Psalter in Brussels and other Fenland manuscripts"
Manuscript book on parchment − 30 × 19.5 cm − 282 pp. 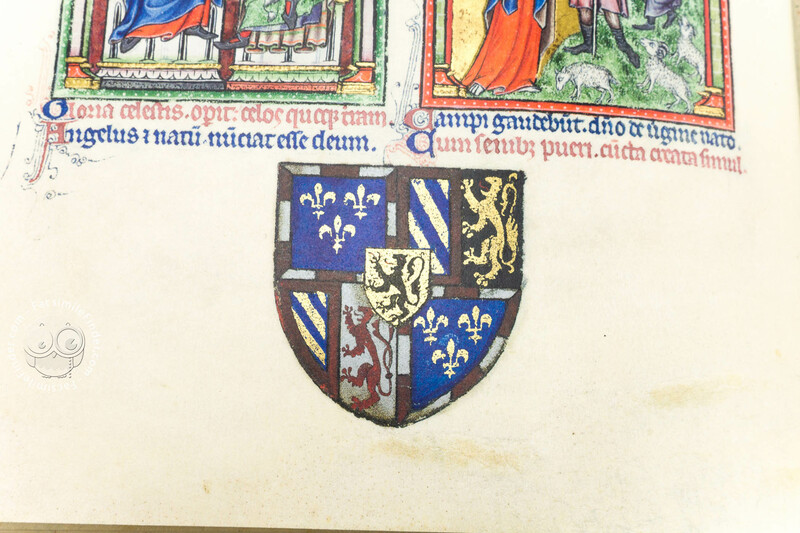 Pope John XXII (1244-1334); Clemence of Hungary, queen of France (1293-1328); Philip VI of Valois (1293-1350); the Library of the Louvre; Philip the Good, duke of Burgundy (1396-1467); the Bibliothèque Nationale de Paris; the Burgundian Library. 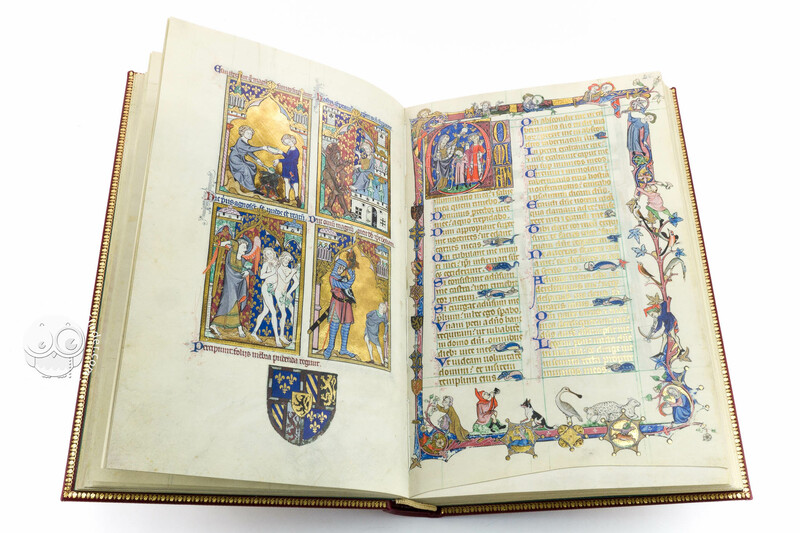 Full-size color reproduction of the entire original document, The Peterborough Psalter in Brussels: the facsimile attempts to replicate the look-and-feel and physical features of the original document; pages are trimmed according to the original format; the binding might not be consistent with the current document binding. 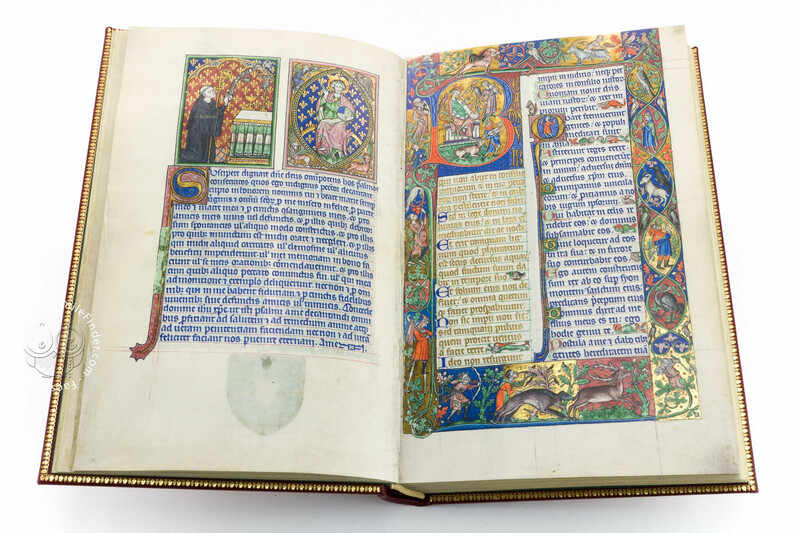 The facsimile edition is prited on a paper which presents a light cockling to better mimic real parchment.